Lip plumpers are lip glosses that use hyaluronic acid or mild irritants like cinnamon oil to temporarily swell lip tissue which gives an appearance of plumping. A good lip plumper will add shape and volume to the lips whereas a bad lip plumper can leave you with flaky, red, flaming lips. Slather the gloss on! Just make sure your lips are totally naked. Any moisture – either from saliva or a balm will prevent the formula from penetrating. Use two complimentary lip hues – swipe on a shimmery rose-colored gloss, then apply a paler pink version over it. Layering two colors creates the illusion of depth so your mouth looks ultraplush. You can whip up your own plumping product at home. Mix a teaspoon of regular olive oil with a pinch of salt and dab on the mouth. The oil moisturizes and the sodium makes the skin on lips puff up rather fast. When in the market for a new lip gloss, the key is to go for the absolute shiniest, moist shimmer infused one you can find (look for words that suggest moisture, like wet, juicy or slick). The more reflective the formula, the fuller it will make your lips look. In general, when you want to fatten up your lips, stick with hydrating lip products, such as glosses and creamy lipsticks. They contain moisturizing agents like emollients, Vitamin E and shea butter, which give the moth a plusher payoff than drier lip stains and matte formulas. After applying a dark lipstick shade (which is going to make lips appear smaller), dab a small makeup brush in a concealer shade that is slightly lighter than your foundation, and run the brush along the outskirts of your lip line. The contrast between the lipstick and the surrounding lightness will make the mouth appear larger. 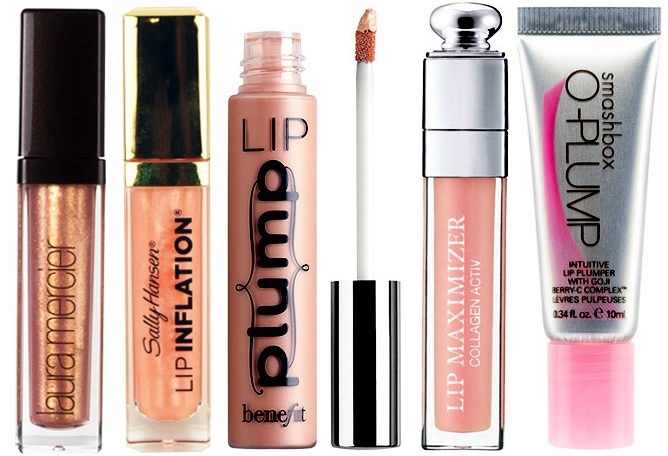 Lip plumpers typically work for only 4 to 5 hours, so don’t forget to bring yours with you when you’re going out.